The Higgs particle, (evaporating interference black holes) found inside silicon wafers? The Higgs particle called Collexon, found inside silicon wafers? 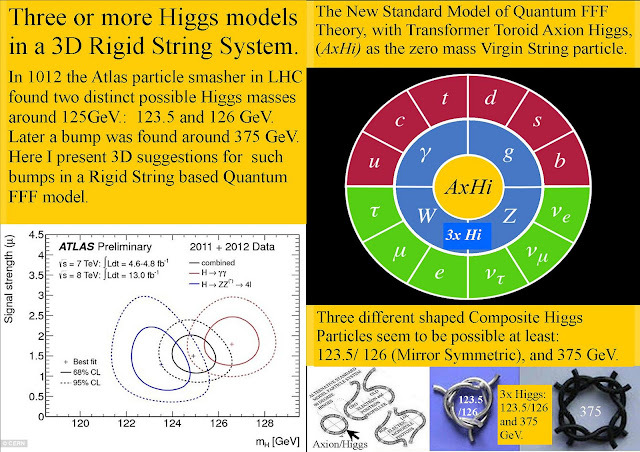 According to Quantum FFF Theory, the Higgs represents a triple magnetic monopole rigid string quantum knot and is already found inside doped silicon wafers after high voltage discharges through the silicon wafer. 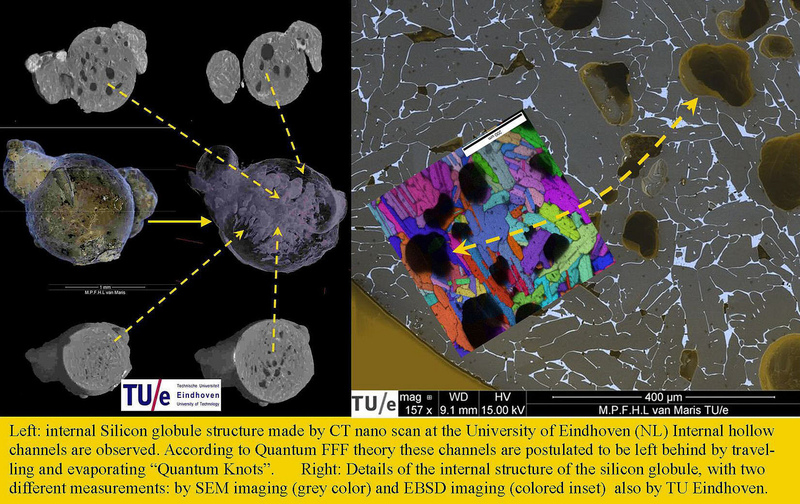 see: Evidence for Evaporating Dark Matter Particles in Silicon fireballs. Was Einstein always right? or is there Quantum Post Relativity evidence? 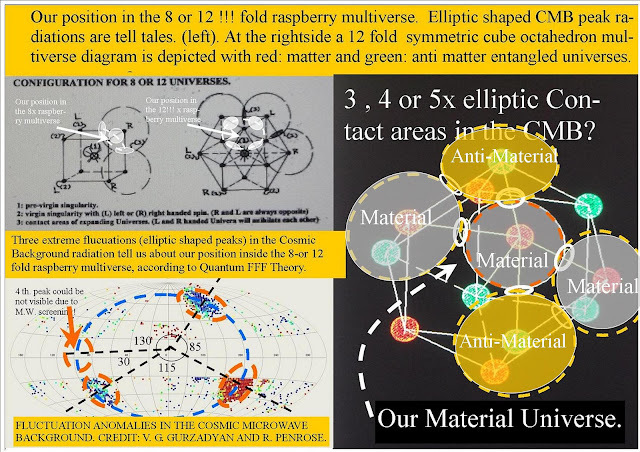 Construction Principles for Chiral “atoms of Spacetime Geometry” Including Space Curvature Around Massive Objects. 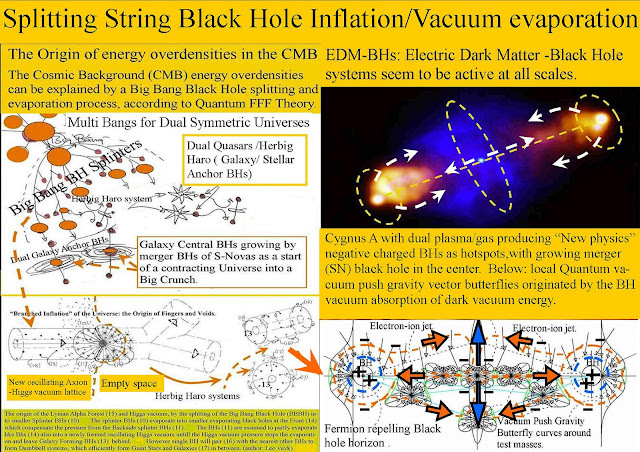 Electric Dark Matter Black Holes are ruling the symmetric multiverse down to the solar system. Central Milky Way Black Hole eating NOT Stars but Herbig Haro Bowshock BlackHholes. Central Milky Way Black Hole eating NOT Stars but dual Herbig Haro Bowshock ( Hotspot) Black Holes leaving stars and plasma jets behind !! 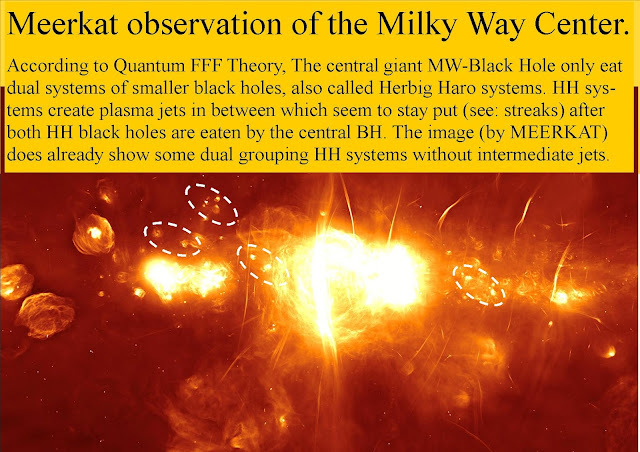 According to Quantum FFF Theory, The central giant MW-Black Hole only eat dual systems of smaller black holes, also called Herbig Haro systems. 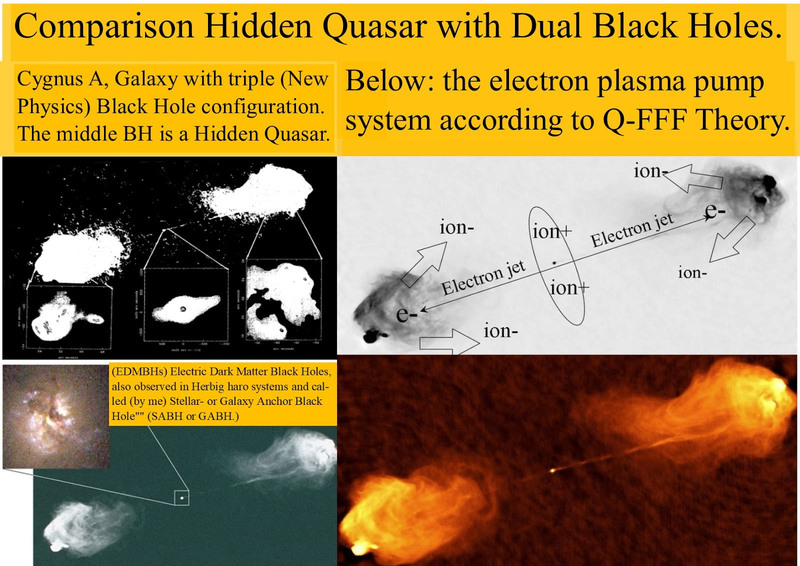 HH systems create plasma jets in between which seem to stay put (see: streaks) after both HH black holes are eaten by the central BH. The image (by MEERKAT)does already show some dual grouping HH systems before the creation of intermediate jets. The main direction of the remaining Herbig Haro plasma jets is perpendicular to the Galaxy equator. 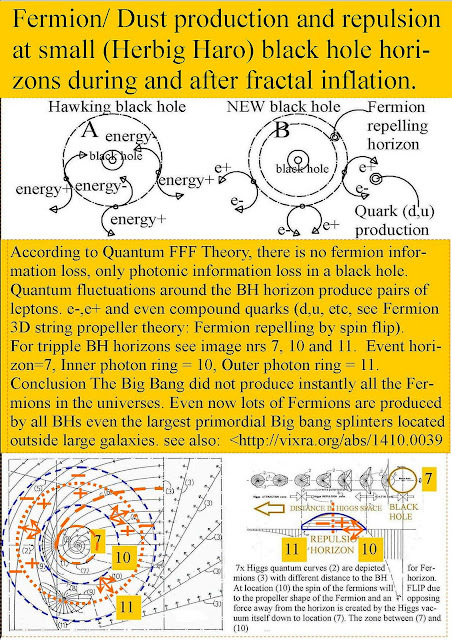 The most natural explanation according to quantum FFF Theory, is that in the Herbig Haro Black Hole Pairing process the Axion/Higgs field vacuum vector array profiles are equipped with an hourglass profile ( butterfly cross section) with the central axis also perpendicular to the Galaxy equator. 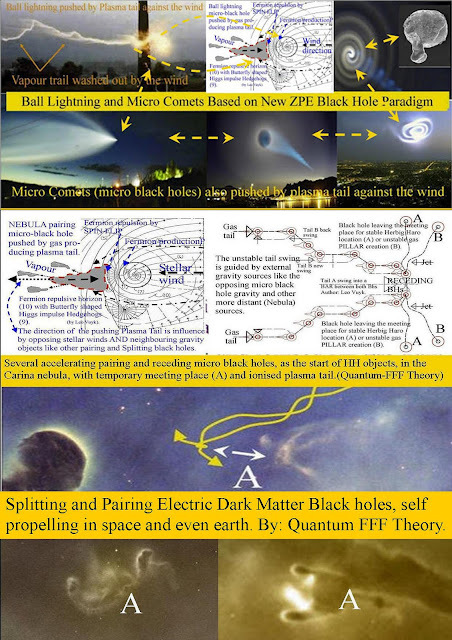 As a consequence the two pairing HH black hole will polarize in the same way. see 2e image. Hourglass polarization of space between two black holes in Galaxies Nebula and the Stars. Quantum FFF Theory (Function Follows Form) is based on open rigid strings, derived from only one closed transformable torus shaped mass less virgin string, called Axion Higgs. 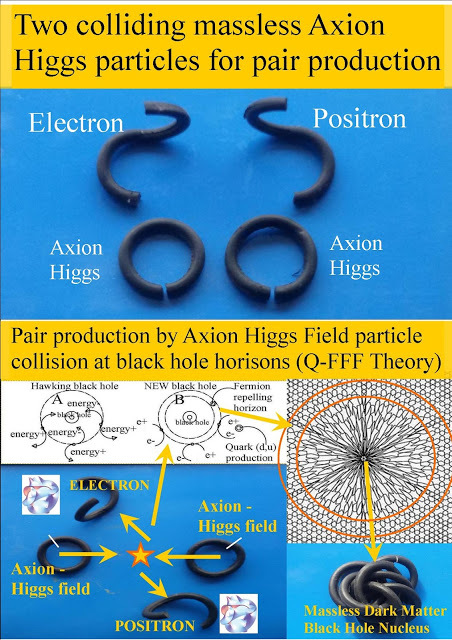 The Axion Higgs ring is assumed to be equipped with 3x internal rotation hinges with 90 degree rotation freedom and one splitting point. 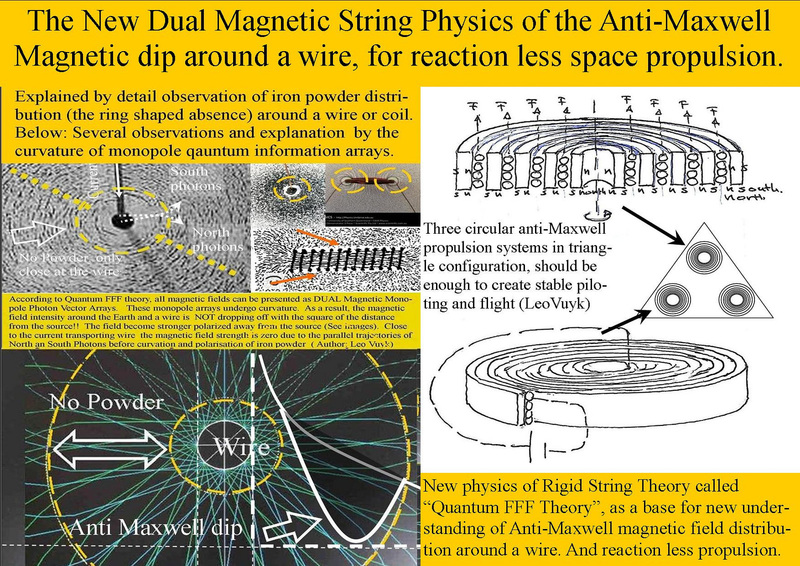 Photons, Gluons, Neutrinos and two leptons (e+e-) are singular open singular monopole Strings, including Magnetic North and South monopole particles. Fermions and Bosons are compound String knots containing two or more interconnected open strings. 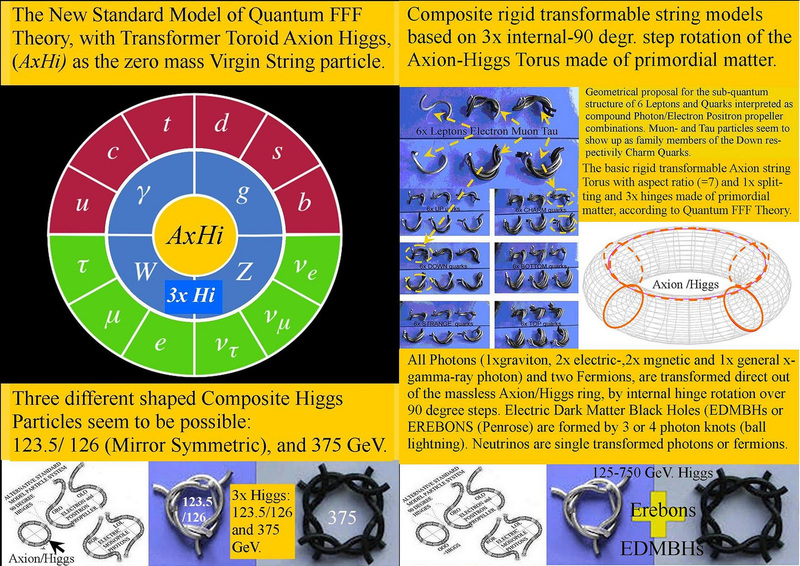 Fermions are supposed to have a chiral form, a propeller shape with left or right handed pitch for positive or negative charge and spin. A third Higgs is assumed to be based on 4x open strings with 375 GeV. 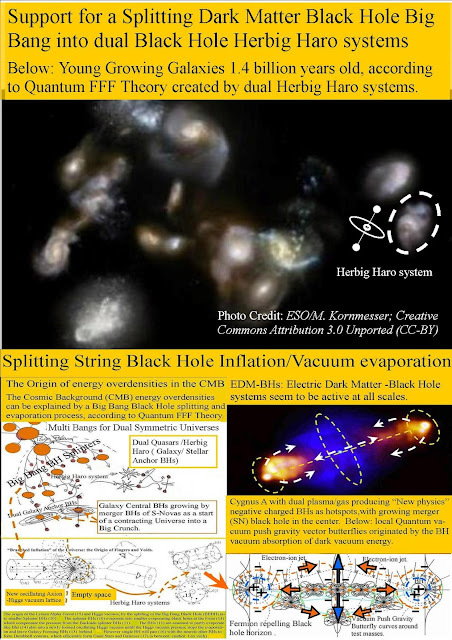 Black holes are assumed to be massive compound knots of virigin Axion Higgs particles without mass but with vacuum pressure gravity.. The consequence of this rigid string model leads to new physics of black holes, magnetic and gravitational interpretation. 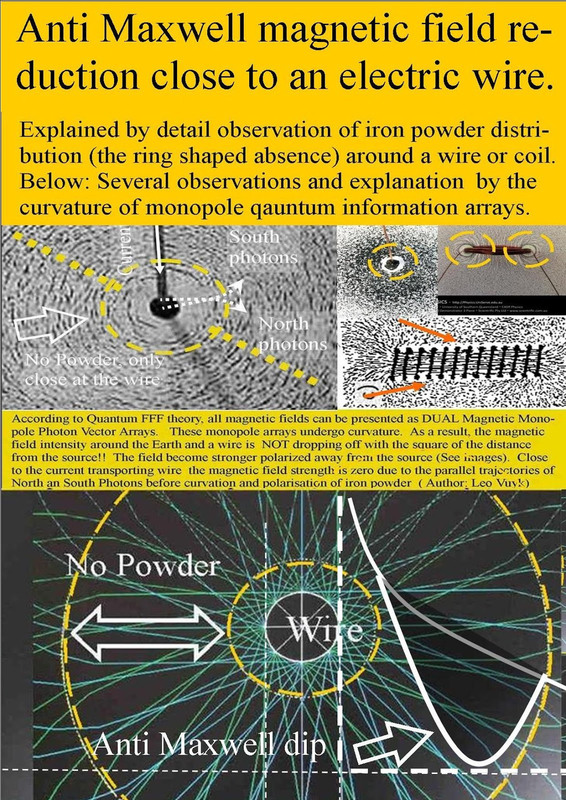 The New Nuclear Magic Number (34) Explained by the Polar Coaxial Ring System of Quantum FFF Theory. Dual Stellar Anchor Black Holes by new physics of butterfly shaped spacetime polarization in combination with a new rigid propeller string theory for decrease of entropy and pair (negative charged plasma) production. 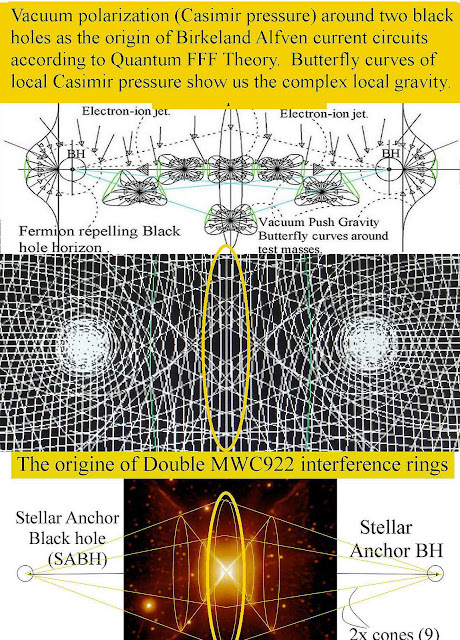 Around black holes the Planck length is polarized with a vector array cross section in the form of a butterfly. 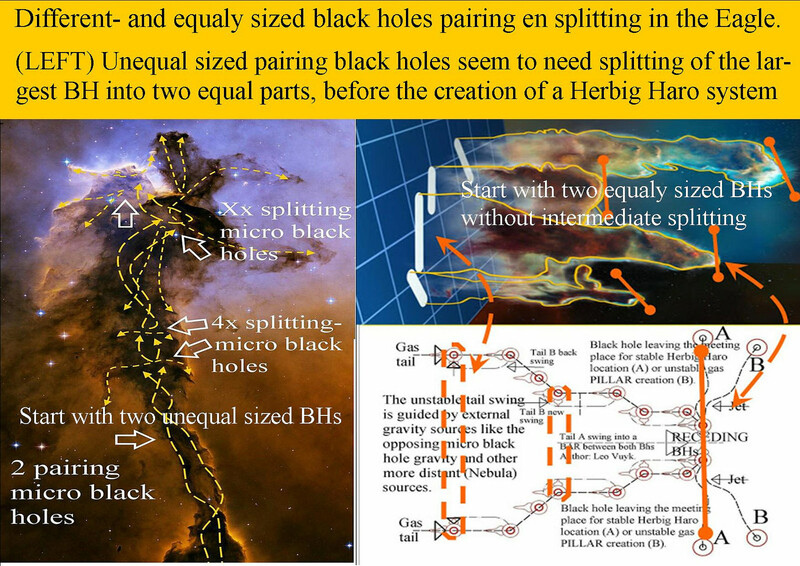 TWO black holes as observed around Herbig Haro Systems (the hotspot black holes) are creating spacetime vector arrays of dual complexity ( see image below) in combination with vacuum push gravity for quick star formation. 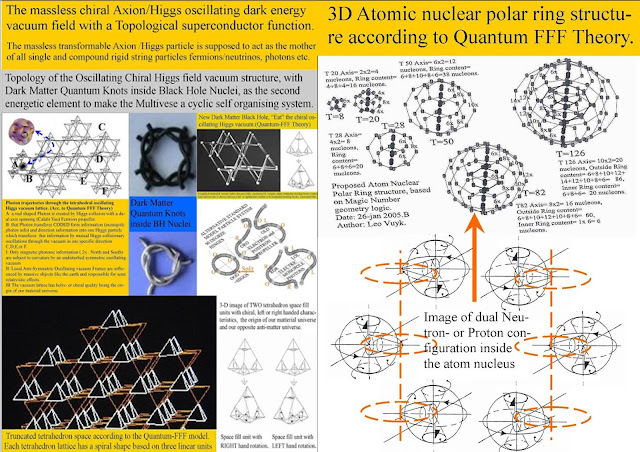 Quantum FFF Theory is a Vortex knot theory based on only one transformable but rigid torus particle called Axion/Higgs. Quantum FFF Theory is a Vortex knot theory based on only one transformable but rigid torus particle coined Axion/Higgs. 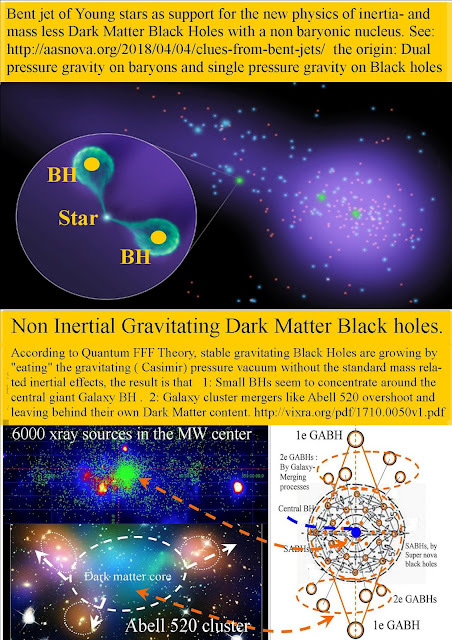 as a consequence, the solar system seems far more extended than we thought and guided by two polar (new physics?) 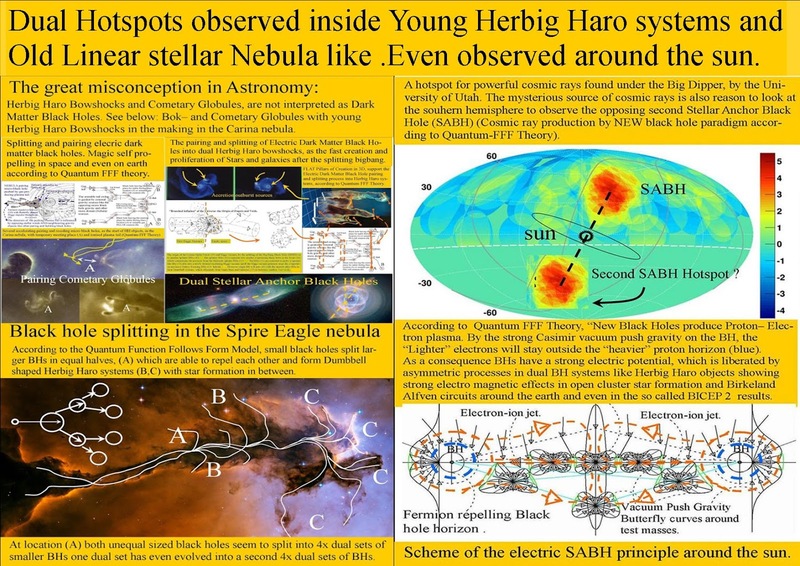 Herbig Haro (HH) hotspots. My suggestion is that there is evidence of a Herbig Haro (HH) structure of the solar system, with two polar located Gamma ray Neutrino sources ( new physics electric ark matter black holes, the former HH bowshocks/ hotspots) far away. 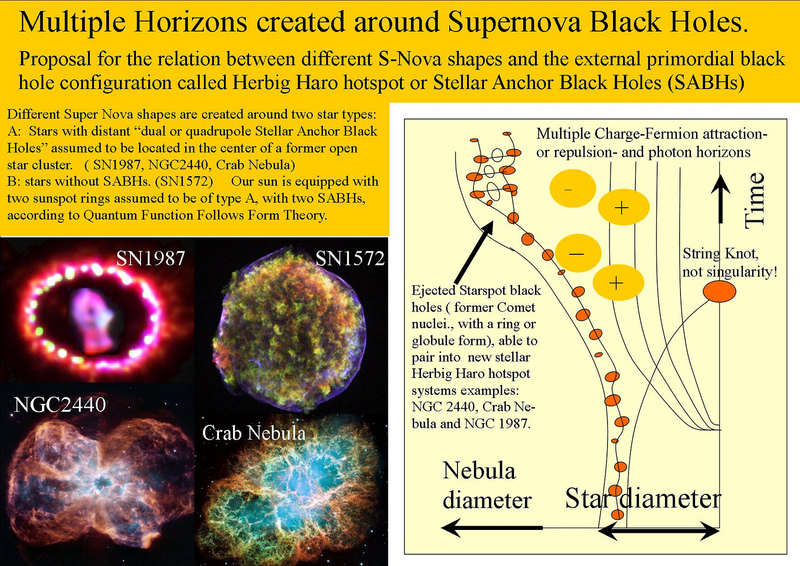 Polar means: into the direction of Ursa Major cluster and Centaurus supercluster. 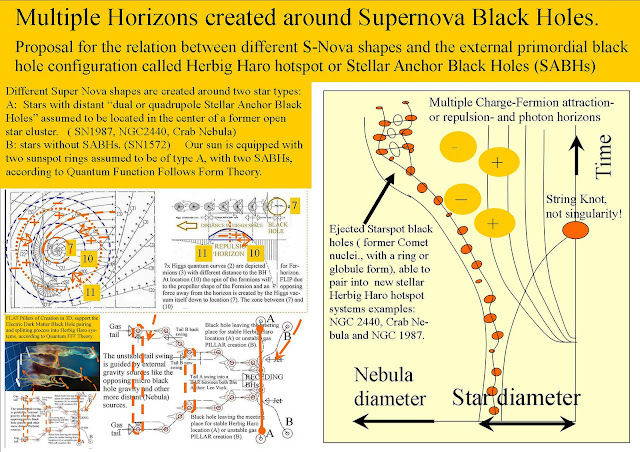 Solar Herbig Haro Black Holes system, Even in 2014 suggested by Quantum FFF Theory. 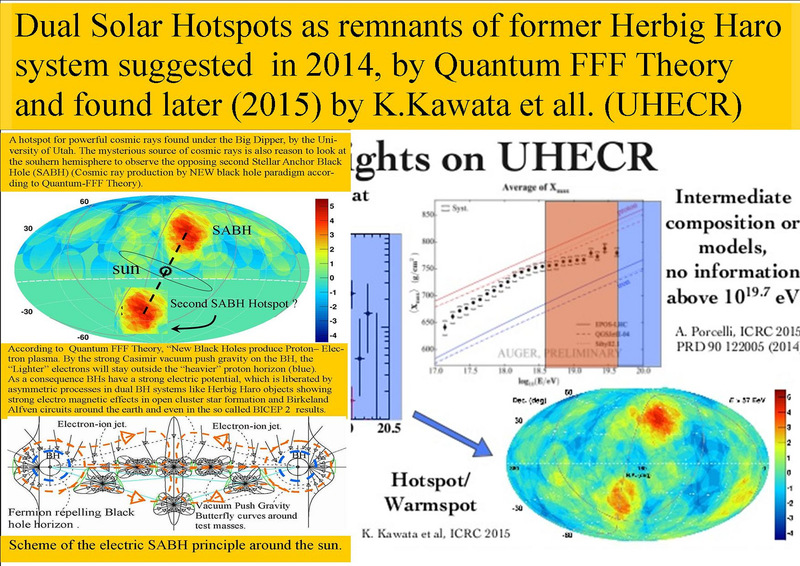 After the NSF press conference however, it is clear that not two but only ONE super Blaser hotspot far away is in the news and not in the local universe. After the initial enthusiasm, however, ( K Kawata PAO for the southern hotspot) additional data slightly weakened the significance of this result, rather than increasing it. 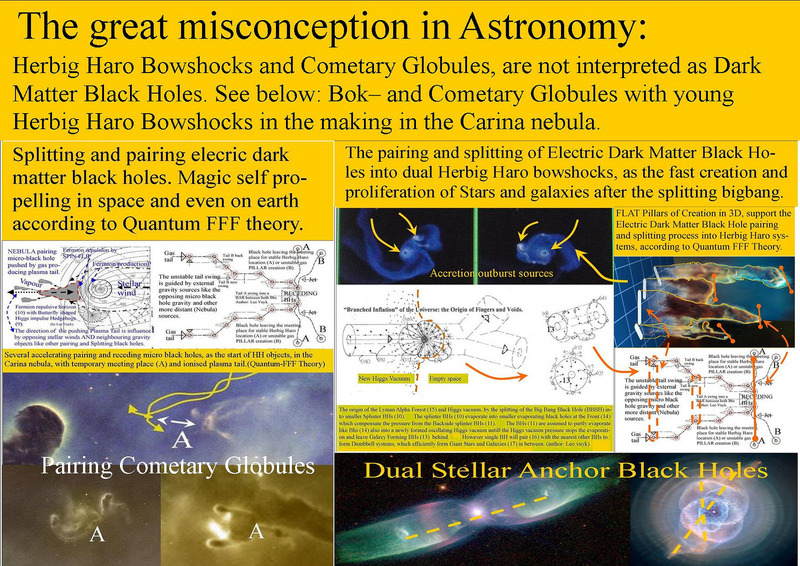 Nevertheless, what is obvious is that the galactic plane is not the prime source of the UHECR. 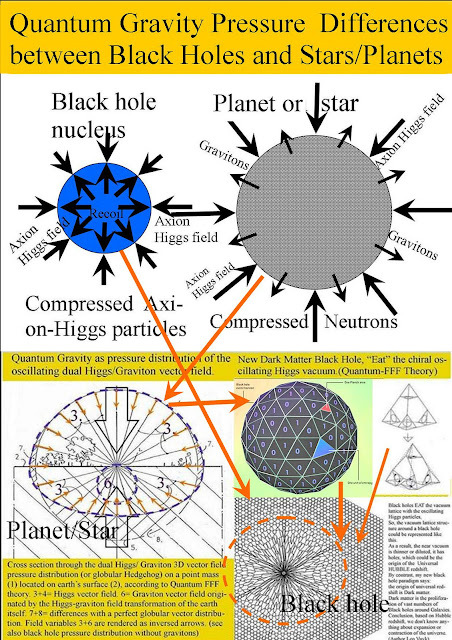 They must therefore originate from somewhere in the large-scale structures of the local universe.! Conclusion: It would be worthwhile to determine the distances from earth of both hotspots. 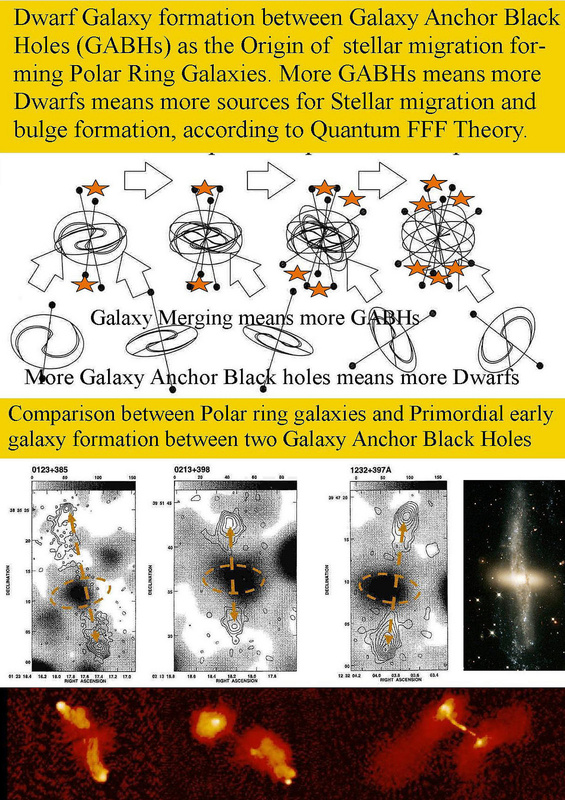 As a support for the universal distribution of such Herbig Haro systems around not only stars but also Galaxies and Galaxy clusters, Even a dual Quasar system is found in the early universe, see below. 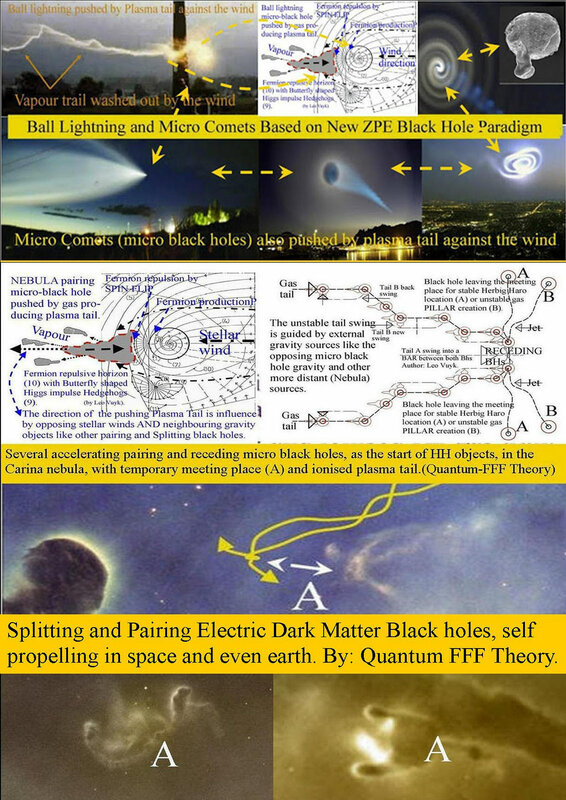 and: The Magic of the New Electric Dark Matter Black Hole on Earth and Space. 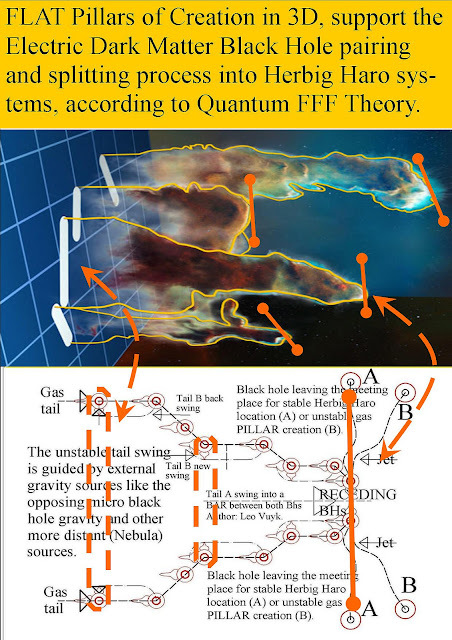 Duality of self propelled micro black holes also found inside Nebula see below. Dual Quasars ( EDMBHs) seem common in the early universe. 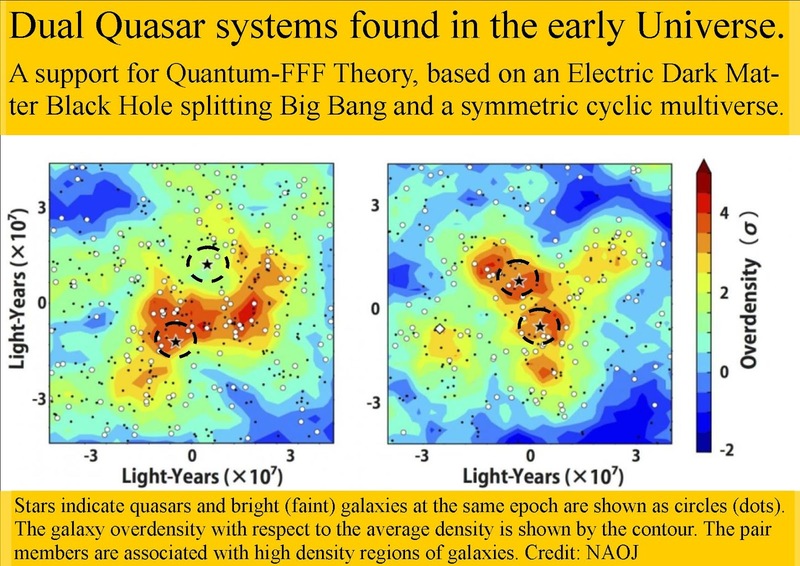 Dual Quasar systems found in the early Universe. A support for Quantum-FFF Theory, based on an Electric Dark Matter Black Hole splitting Big Bang and a symmetric cyclic multiverse. Stars indicate quasars and bright (faint) galaxies at the same epoch are shown as circles (dots). 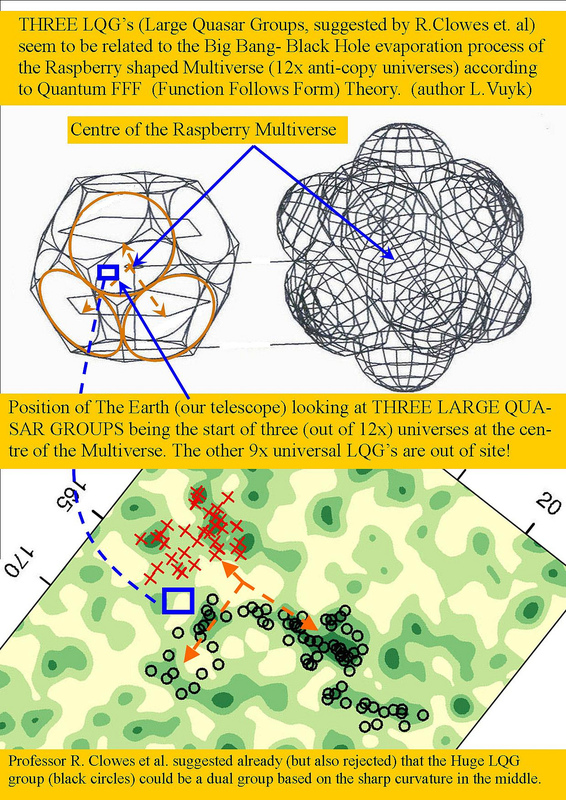 The galaxy overdensity with respect to the average density is shown by the contour. The pair members are associated with high density regions of galaxies. Even micro scale EDMBHs ( electric dark matter black holes ) seem to group two by two tending to make Herbig Haro systems. 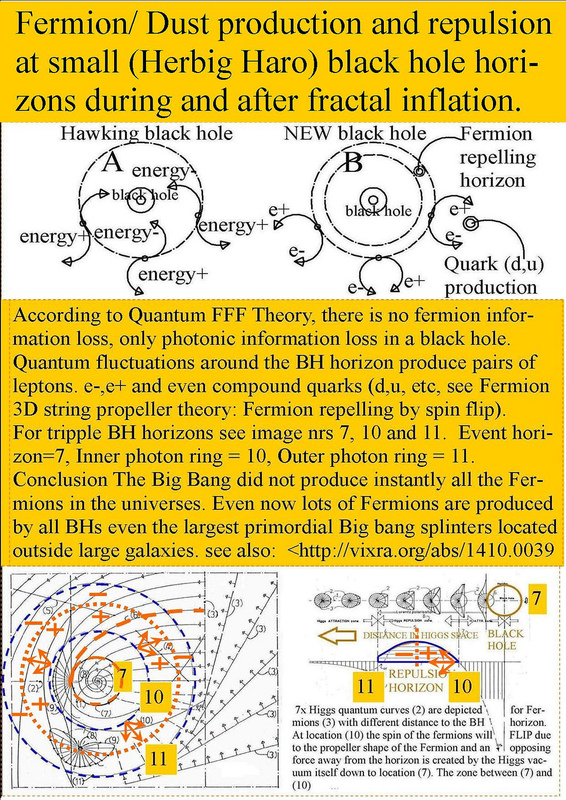 Grand Unification of 4 Forces According to the Quantum FFF Model by di-Monopole Repeller Rigid String Pressure. 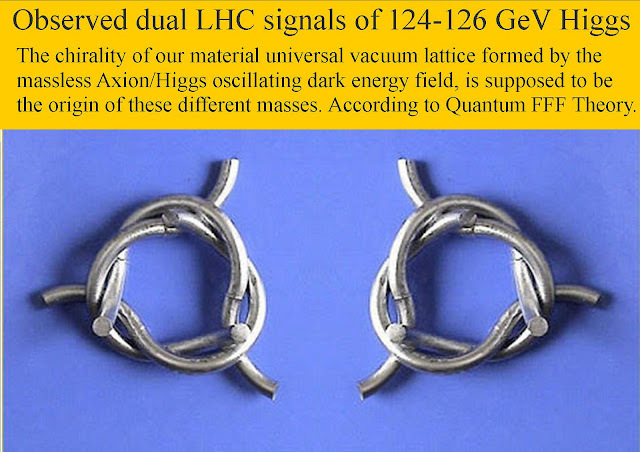 According to Quantum FFF Theory (Function Follows Form a MONOPOLE STRING THEORY) the magnetic quantum field has always TWO different shaped monopole components: a North- and a South component. Experimental verification of Quantum FFF String Theory. 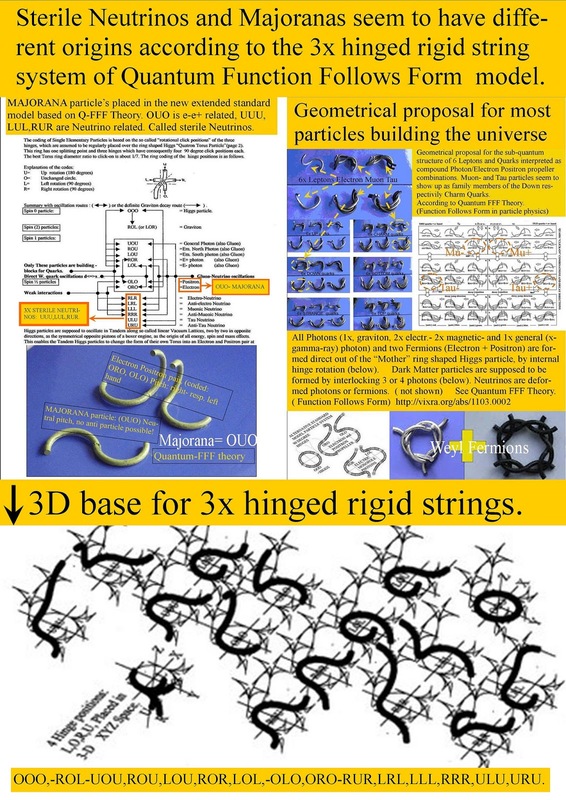 Experimental verification of String Theory based on rigid transformable strings, combined as click-on pop-up fermionic quantum knots. 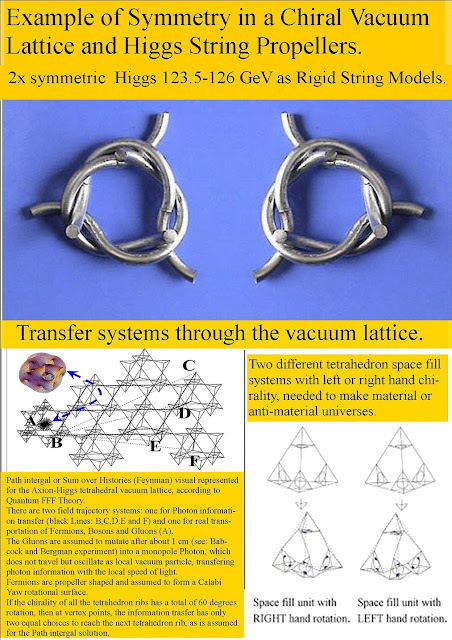 1: Bohmian Double Slit Interpretation by Dual Entangled Universes, and the Benjamin Libet Experiment. 2; New Physics by Table Top Experiments. 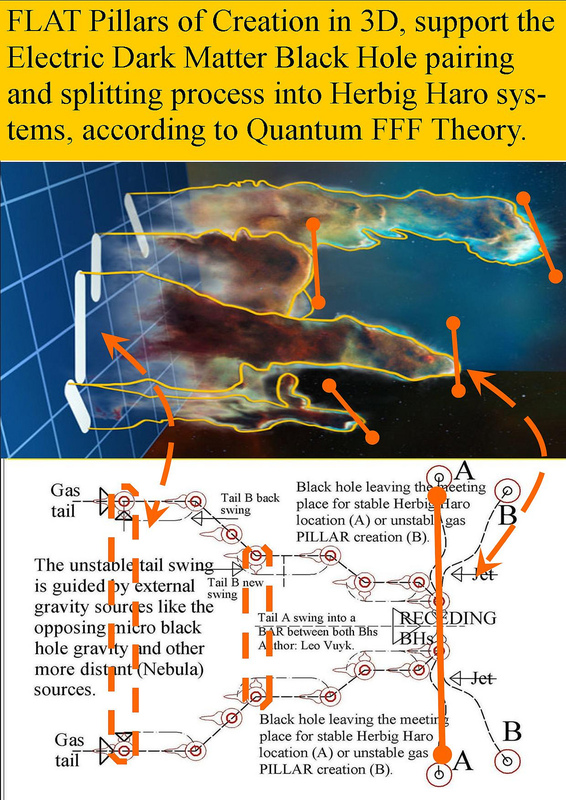 3; Quantum FFF theory Experiments, a summary. 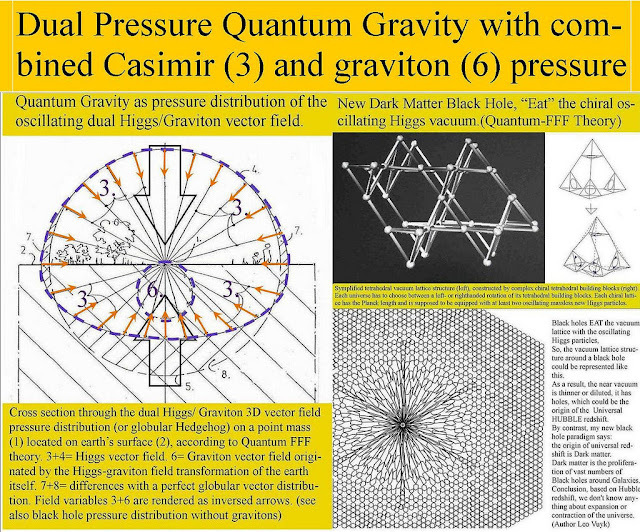 4; Experiments to determine the mass related Lightspeed extinction volume around the Earth and around spinning objects in the Lab. 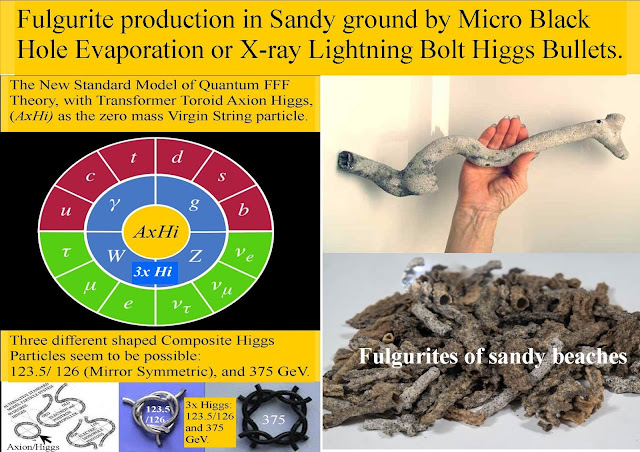 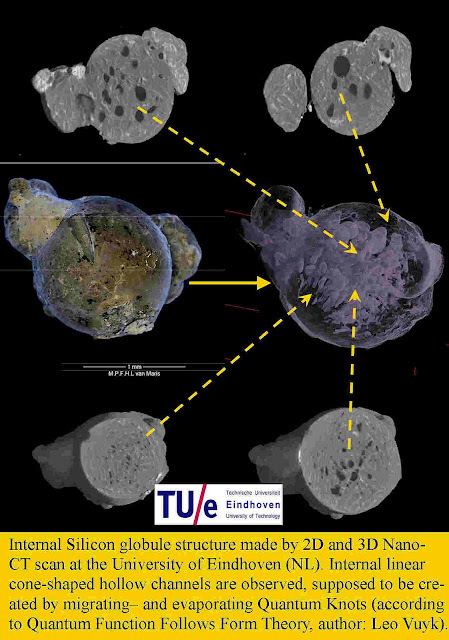 5; Silicon Based Ball Lightning Globule Structures and Signs For accumulation and retarded decrease of tunneling energy bullets. 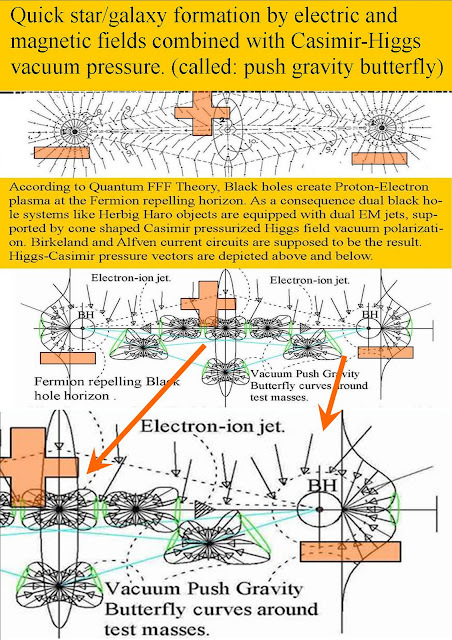 repelling horizons with positive or negative charge! 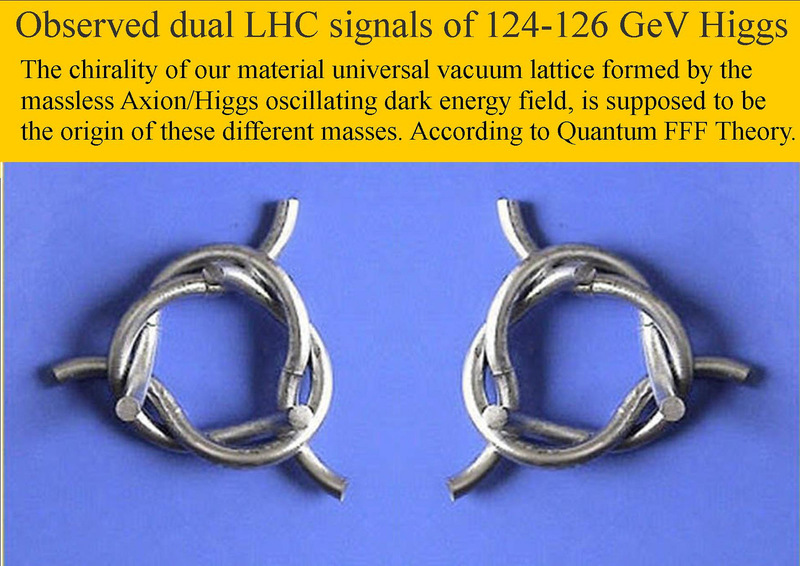 a one photon double split experiment as suggested by David Bohm..